1908 Treadwell New Year Medallion. Sitka History Museum, 86.117. Like a wise and trusted elder, museum artifacts possess knowledge born of their experiences in the world and the meanings attributed to them by the people with whom they have come into contact. They help us to tell stories of our shared heritage and offer guidance about what we may become. But a museum artifact may symbolize very different things to different people, and they embody meanings that shift and change through time. The Sitka History Museum holds one such artifact in its collections. The now rusted and broken metal medallion fragment measures just over four by three inches and displays embossing that reads, “A Happy 1908 New Year, Treadwell.” The medallion began its life at the Treadwell Foundry as a cherished memento commemorating the passing of a successful year, celebrating human hopes for the year ahead, and most importantly, representing inclusion in a vibrant and prosperous Alaskan community. As the community dissolved, so too did the optimism and sense of belonging forged in the medallion, and its owner abandoned it in a storage shed. A discarded item left to the elements, for many decades the medallion became a mere curiosity to those who visited the deserted ghost town. In the 1970s, a Sitka resident attributed historical value to the item, collected it, and donated it to the Sitka History Museum. Once again, the meaning of the medallion changed as it became an important relic worthy of perpetual care. 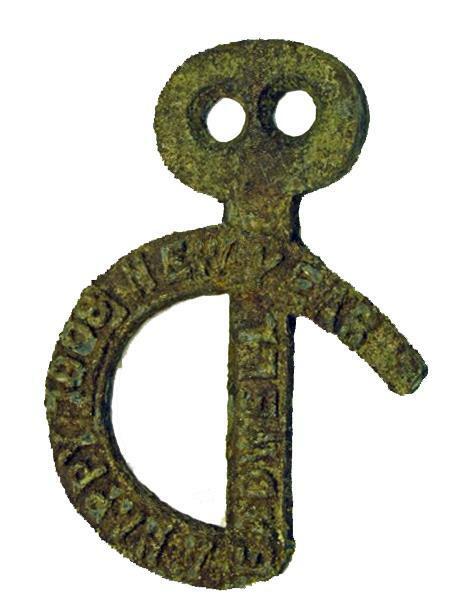 Today, further research attributes new significance to the artifact as an intriguing irony reveals an unsolved mystery that ventures beyond the state of Alaska to span the continent. It’s 1881 and thirty-nine year old John Treadwell is working as a carpenter in California when he gets news of the gold strike on Douglas Island in Southeast Alaska. Having gained experience in both California and Nevada mines, Treadwell sets out for Alaska financed by John Fry, the very same wealthy San Francisco banker for whom Treadwell was building a house. After surveying the Gastineau Channel region of Douglas Island, the underwhelmed Treadwell waits to board his ship back to California when he happens to meet French Canadian prospector, Pierre Joseph Erussard, and buys from him the Parris Claim Lode for a mere $400. What follows can only be described as Alaskan mining history. Treadwell, Fry and their friend John Freeborn quickly form the Alaska Mill and Mining Company. They continue to purchase other claims in the region, and soon the Treadwell Complex is the largest in the world with four mines and five stamp mills. At the peak of operations, 960 stamps crush a record 5,000 tons of rock every day and 2,000 workers support mining activities that run twenty-four hours a day, 363 days out of the year. The largest hoist in the world centralizes the lifting of ore from three of the mines in the Treadwell Complex, and state-of-the-art milling practices economize ore refining and maximize profits. In total, mining efforts at Treadwell produce one hundred tons of gold worth nearly seventy million dollars. A bustling community springs to life and the diverse town becomes home to individuals representing seventeen nationalities. The wages being paid to Treadwell miners are among the highest in the entire world. Single male miners live in sizable furnished bunkhouses with electricity, steam heat, and regular cleaning service. Families reside in over one hundred cottages provided by the company. The largest dining hall on the Pacific Coast, about half the size of a football field, services the round-the-clock operations by producing high-quality hearty meals at noon and midnight and packing lunches for the miners to take to work. The community even boasts its own marching band, bowling alley, tennis courts, dance hall, and Alaska’s first indoor swimming pool. 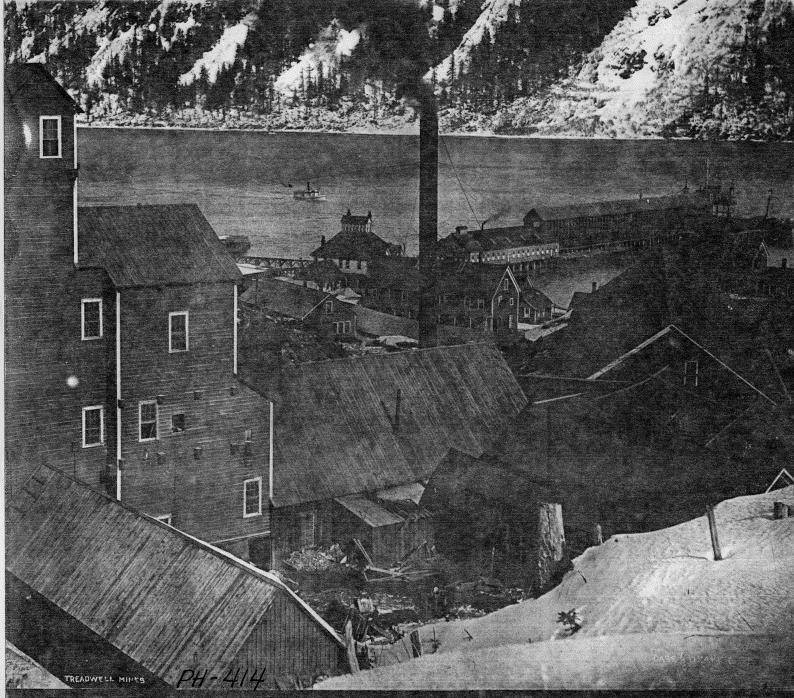 Treadwell sells his interest in the mines in 1889 for $1.5 million, and this is where many writers of Alaska’s mining history depart from John Treadwell. After an unsuccessful venture into coal mining in western Alaska, Treadwell moved back to California where his brother served as a director for the California Safe Deposit and Trust Company, established in 1882. In 1890, John and his brother James opened coal mines about forty miles west of Modesto, California. Like in Alaska, Treadwell built a company town for the miners and their families, and named the town Tesla in honor of famous inventor Nikola Tesla. After building a railroad to Stockton, California and organizing the San Francisco and San Joaquin Coal Company, the Treadwell brother’s Tesla Coal Mines became the leading coal producer in the state. It would seem as if the Treadwell brothers could not lose. The same region that produced an average of 500 tons of coal every single day also held rich clay and sand deposits. They shipped the sand to the Pacific Window Glass Company in Stockton and built the Carnegie Brick and Pottery Company just four miles away from Tesla on a spur serviced by their railroad. The brothers owned a sprawling estate in nearby North Oakland, invested in numerous business ventures, and became well known members of San Francisco’s elite class. But their winning streak was about to come to a screeching halt. At 5:12 AM on April 18, 1906 a devastating earthquake struck San Francisco and fires broke out around the city. James’ California Safe Deposit and Trust Company lost many important ledgers and papers to the fire. Like so many other businesses in California, the brothers found their assets financially impacted by the catastrophic event. For the Treadwell brothers, this may have been both a blessing and a curse, as many later accused the bank of lying about the destruction of their documents as a convenient excuse to conceal shady business practices. On October 30, 1907, the California Safe Deposit and Trust Company closed its doors for the last time, allegedly strained by economic loss resulting from the earthquake and subsequent fires. The bank held nine million dollars of depositor’s money, but the safe was empty. Journalists reported that the bank’s many account holders were left penniless, some became mentally unstable and spent time in insane asylums, and several even committed suicide. Investigations revealed that the company had loaned a full three-quarters of their holdings to their own directors, employees, and the businesses in which they held interests. The San Francisco and San Joaquin Coal Company and the Carnegie Brick and Pottery Company were just two of the many Treadwell-owned businesses financed by loans from the California Safe Deposit and Trust Company. The courts placed fault for the company’s downfall on President David T. Walker, Manager J. Dalzell Brown, and legal advisor Walter J. Bartnett, but attentions soon turned to the Treadwell brothers. By January 1, 1908, the front page of the San Francisco newspaper The Call read, “Former Alaska Gold King Now Locked in Cell”. Indicted on embezzling from the California Safe Deposit and Trust Company, James Treadwell found himself unable to locate anyone willing to pay his $75,000 bail and was forced to spend the holiday in jail. Contrary to the message embossed on the Treadwell Foundry medallion, New Year’s day, 1908 was anything but happy for the Treadwell family. A few months after his brother was imprisoned, John Treadwell went before a grand jury as his intimate connection to the bank came under question. To the amazement of many, the jury could not find enough evidence to hold him. Public astonishment continued as his brother James was found innocent of a perjury charge and later mysteriously had the embezzlement charges against him dropped in 1910…all for lack of evidence. In fact, James’ associates, Walker, Brown, and Bartnett were unscathed by the civil suits that followed in the years to come, and only Brown served a brief term in jail. John Treadwell did not fare as well. He borrowed nearly two million dollars from the California Safe Deposit and Trust Company on behalf of his companies. When the bank closed, the courts turned to the Treadwell brother’s companies to pay on their debts. With his brother James in bankruptcy, John became a target. Civil suits plagued John Treadwell for years and in 1914 he had exhausted his assets and still faced nearly three million dollars of debt. He filed for bankruptcy and left California. John Treadwell passed away in his apartment at the Great Northern Hotel in New York in 1927 at the age of eighty-five. He was alone and broke. The actual fate of the California Safe Deposit and Trust Company’s conveniently destroyed ledgers and John’s culpability in the bank’s embezzlement scandal remain a mystery. In an odd parallel, John Treadwell’s Alaska mines also suffered a crushing blow as a result of questionable practices. In 1917, the proximity of the mine to Gastineau Channel came head-to-head with mining methods unsuited to mining below sea level. Three mines flooded and many miners found themselves suddenly unemployed. The fourth mine closed five years later, bringing hard rock mining to an end on Douglas Island. 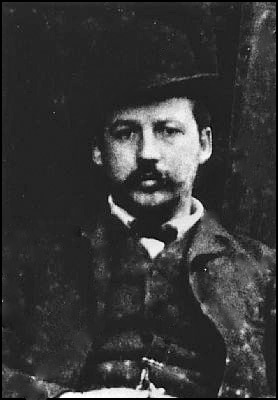 John Treadwell. Courtesy of the National Mining Hall of Fame and Museum. Today, the popular lore of Alaska’s great gold rush remembers the Treadwell Complex for its legendary status as the one-time largest and most technologically-advanced mine in the entire world. John Treadwell’s place in history has been secured by his induction into the National Mining Hall of Fame for his role in developing and operating the first successful large-scale, low-grade gold mine in Alaska. But a rusty fragment of one of Treadwell Foundry’s annual commemorative medallions reminds us that our history is often more nuanced and intriguing that the grand narratives suggest. Just as John Treadwell faced many drastic changes in his lifetime, so too has this medallion’s meaning and embodied context morphed through time: a memento, refuse, curio, museum artifact, and an enduring mystery. 1927 Once Rich Miner Dies Almost Poor. November 7:4. 2003 Southeast Sagas: The Treadwell-Alaska’s renowned first large-scale, low-grade gold mine. Juneau Empire 31 December. Juneau, Alaska. 2010 Treadwell Gold: An Alaska Saga of Riches and Ruin. University of Alaska Press, Fairbanks. 2007 Treadwell Mine Historical Trail: Walking Tour and Historic Guide. Taku Conservation Society, Juneau, Alaska. 1908 Statement of the Condition of the California Safe Deposit and Trust Company, in Liquidation. Report of the Board of Bank Commissioners of the State of California Showing the Financial Conditions of the Banks of California at the Close of Business July 15, 1908 20-34. State Printing Office, Sacramento, California. 2015 Electronic document, John Treadwell. http://www.mininghalloffame.org/inductee/treadwell, accessed November 12, 2015. 2002 History of Tesla: A California Coal Mining Town. Mines Roads Books, Fremont, California. 1910 Treadwell Free of Fraud Charges. July 24:37. 1913 Bids are Sought for Bank Wreck. January 18:2. 1914 May Recover Coin from Miner. June 21:3. 1920 The Romance of Mining Discovery. Mining and Scientific Press 120(19):669-676. 1907 Broken Bank Disgraces Two. December 8:17, 22, 23. Treadwell Also Held Guilty. December 31:1, 2. 1908 Former Alaska Gold Kind Now Locked in Cell. January 1:1, 2. 1911 John Treadwell Loses $41,090.72 by Default. January 10:3. 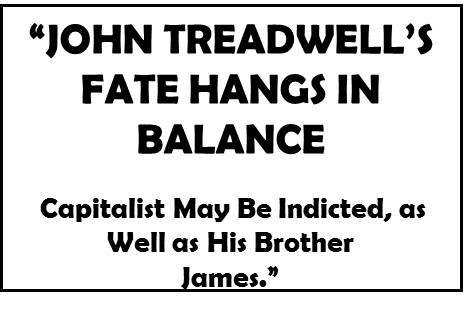 1908 John Treadwell’s Fate Hangs in Balance. May 1:8. 2007 The Birdman of Treadwell: Diary of a Treadwell Gold Miner 1903-1904. AuthorHouse, Bloomington, Indiana.